Our modern, efficient and practical gas cookers are perfect for households that love to cook. 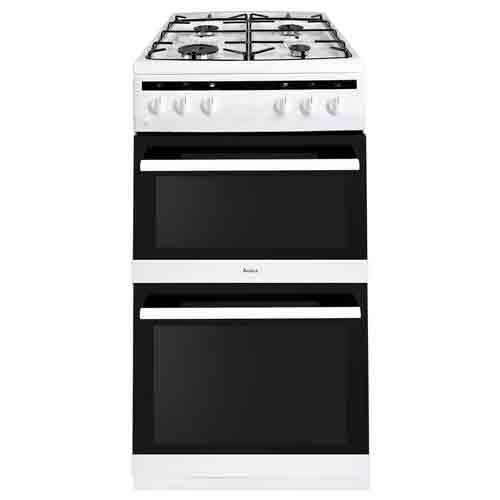 Choose from a single or twin cooking cavity and decide whether you would prefer to have a 50cm or 60cm wide cooker. This comprehensive range is full of different options, and with finishes in smart stainless steel or classic white the modern designs are perfect in any kitchen setting. Look out for the extra features that come as standard on our gas cookers like automatic ignition, a flame failure safety device that cuts off the gas if the flame goes out, Procook trays and telescopic, slide-out shelving to make cooking easy and fun. 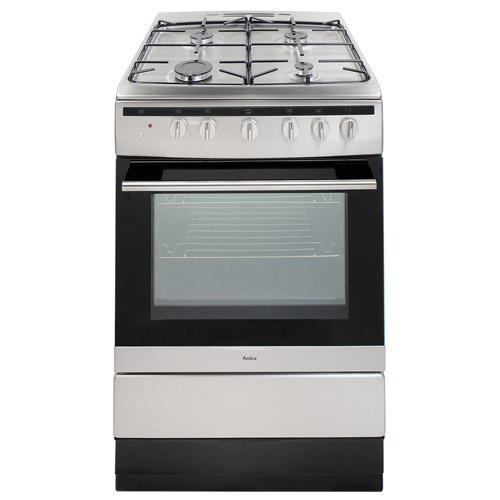 The 608GG5MSW is a 60cm single cavity gas cooker with a four burner. The hob has enamel pan support and various different burner sizes. The oven has a electric grill with variable temperature control along with flame failure for safety. 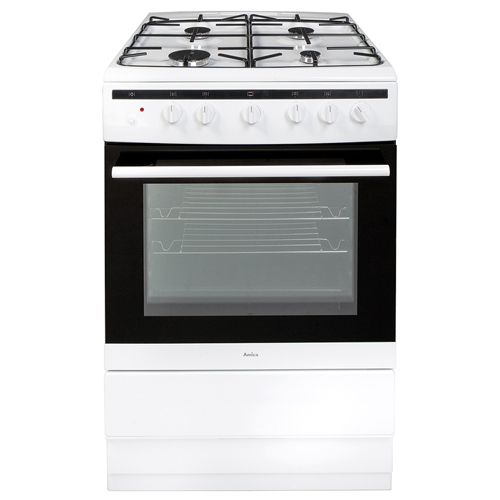 The 608GG5MSXX is a 60cm single cavity gas cooker with four burner. The hob has enamel pan support and various different burner sizes. The oven has a electric grill and oven with variable temperature control along with flame failure for safety. 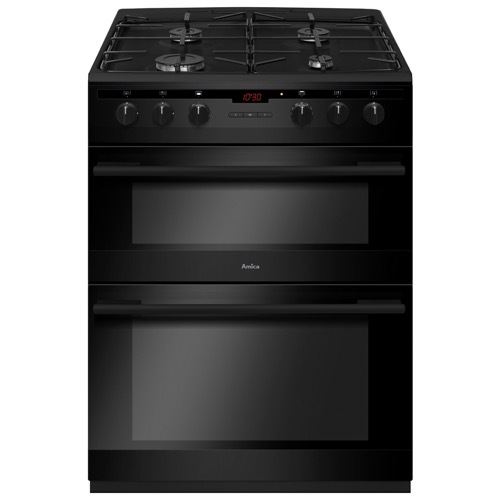 The new AFG5100WH is a 50cm freestanding cooker with a gas twin cavity and gas hob. The oven has double glazed doors with removable inner door glass for easy cleaning, an interior light in both cavities and easy clean enamel interior. The hob consists of 4 burners, 2 semi-rapid, 1 auxiliary and 1 rapid to meet different cooking needs. The hob has enamel pan supports, automatic ignition and a flame failure safety device. 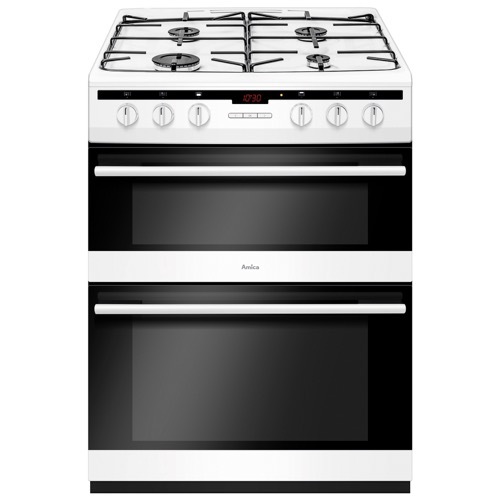 The AFG5500WH is a 50cm freestanding cooker with a double oven and gas hob. The gas hob has 4 burners, enamel pan supports and a flame failure device for added safety. The gas oven has white rotary control knobs, interior lights and double glazed doors with removable inner door glass for easy cleaning. The AFG6450SS is a 60cm freestanding cooker with a gas double oven, a digital programmer with an LED display and a 4 burner gas hob, finished in stainless steel. The ovens and hob both have silver rotary control knobs on the fascia, and the digital programmer is button control. The AFG6450SS has easy clean enamel interior and catalytic liners in both ovens, double glazed doors with removable inner door glass and an interior light. The hob has enamel pan supports, automatic ignition and a flame failure safety device. 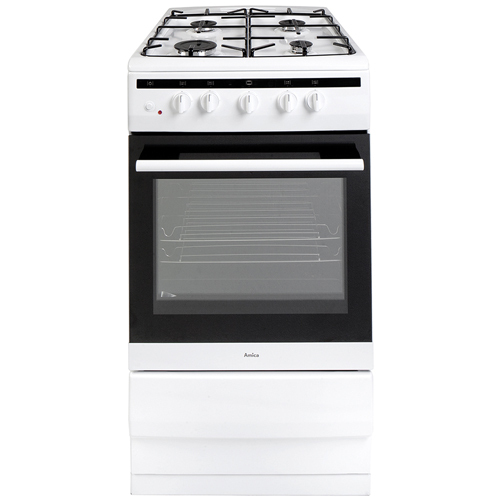 The AFG6450WH is a 60cm freestanding cooker with a gas double oven, a digital programmer with an LED display and a 4 burner gas hob, finished in white. 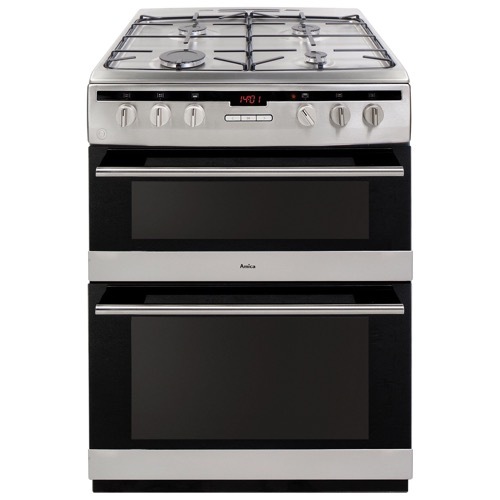 The ovens and hob both have silver rotary control knobs on the fascia, and the digital programmer is button control. The AFG6450WH has easy clean enamel interior and catalytic liners in both ovens, double glazed doors with removable inner door glass and an interior light. The hob has enamel pan supports, automatic ignition and a flame failure safety device.